One of the highlights of military service was the “Active Q Life” program designed to get guys out of the barracks and involved with German American relationships, POW camps, etc. in off-duty time. However, the greatest highlight of his military service was meeting his wife, who was also in the Army. Detroit-born, Demone came to Georgia due to the recession that resulted from the auto industry decline in Detroit. He quickly found a job in Georgia, but when he lost it, so many other things went wrong. Demone had been saving his money because he planned to return to Detroit where he had family, and good relationships with them. However his savings ran out while using them for living expenses during unemployment. His mom passed a year ago, and by the time he went home for funeral services, he was estranged from his family. 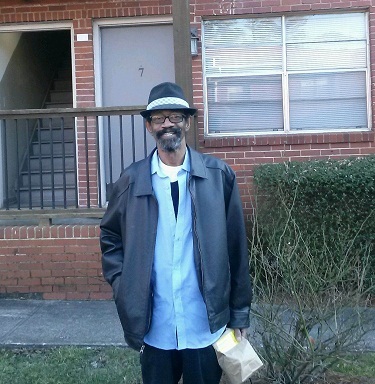 Finding himself homeless and unemployed, the VA referred Demone to Homes of Light Housing Program from April – December.